«Просто» передача звуковых «голограмм» – это ещё не язык?! То, что животные разговаривают друг с другом, – давно доказанный факт. Можно вспомнить хотя бы язык луговых собачек. Эти грызуны передают друг другу вполне осмысленные сообщения – такие, как, например, «вот идёт большой человек в красном». В том, что дельфины общаются между собой, никто не сомневался, и вот, наконец, их язык частично расшифрован. И он совершенно не похож на человеческий! Американские и британские исследователи смогли обучить дельфинов комплексным предложениям, состоящим из существительных и глаголов, транслируя им записанные эхолокационные сигналы. Таким образом, эти животные способны понимать человеческий язык, и к тому же у них есть свой собственный визуальный язык, который даже, наверно, нельзя назвать языком. Известно, что дельфины способны с помощью эхолокации получать звуковые образы определённых объектов и передавать их друг другу, имитируя отражённый ультразвуковой сигнал. Каждый из этих звуков является голографическим представлением объекта. Разумеется, просто передача звуковых «голограмм» – это ещё не язык. Но Джек Кассельвиц, один из учёных, работающих над изучением того, как дельфины общаются, говорит, что дельфины передают с помощью ультразвуковых образов всю необходимую информацию, так что мозг животного распознаёт этот сигнал как картинку. «Наша новая модель языка дельфинов заключается в том, что они способны не только посылать и принимать образы объектов вокруг них, но создавать независимые звуковые картины, представляя то, о чём они хотят сообщить, – говорит Кассельвиц. – Для нас, людей, сложно дистанцироваться от нашей модели мышления символами, чтобы понять, каким образом дельфины мыслят целостными картинами. Наши личные верования, идеология и воспоминания пронизывают наше общение, включая описания чего-либо и понимания каких-либо вещей. Дельфины, похоже, преодолели стадию человеческого языка и изобрели форму общения, не похожую на нашу. Фраза «лучше один раз увидеть, чем сто раз услышать» приобретает новое значение». В отличие от человеческих языков, дельфины из любой точки света способны понимать друг друга, в то время как у нас существует куча диалектов и человек из другой языковой группы не способен понять собеседника из другой. Развитие речи учёные связывают с увеличением головного мозга, и долгое время было непонятно, почему у дельфинов такой большой мозг, притом что их «язык» был до сих пор непонятен человеку. Теперь же Кассельвиц утверждает, что такой большой мозг этих животных предназначен именно для комплексного общения с помощью звуковых картин. Сам Кассельвиц говорит: «Наши исследования отвечают на давний вопрос доктора Джилл Тартер из института SETI: одни ли мы во Вселенной? Теперь мы точно можем заявить, что нет. Поиск иного разума увенчался на Земле». Researchers in the United States and Great Britain have made a significant breakthrough in deciphering dolphin language in which a series of eight objects have been sonically identified by dolphins. Team leader, Jack Kassewitz of SpeakDolphin.com, ‘spoke’ to dolphins with the dolphin’s own sound picture words. Dolphins in two separate research centers understood the words, presenting convincing evidence that dolphins employ a universal “sono-pictorial” language of communication. We are beginning to understand the visual aspects of their language, for example in the identification of eight dolphin visual sounds for nouns, recorded by hydrophone as the dolphins echo located on a range of submersed plastic objects. The British member of the research team, John Stuart Reid, used aCymaScope instrument, a device that makes sound visible, to gain a better understanding of how dolphins see with sound. He imaged a series of the test objects as sono-pictorially created by one of the research dolphins. In his bid to “speak dolphin” Jack Kassewitz of SpeakDolphin.com, based in Miami, Florida, designed an experiment in which he recorded dolphin echolocation sounds as they reflected off a range of eight submersed objects, including a plastic cube, a toy duck and a flowerpot. He discovered that the reflected sounds actually contain sound pictures and when replayed to the dolphin in the form of a game, the dolphin was able to identify the objects with 86% accuracy, providing evidence that dolphins understand echolocation sounds as pictures. Kassewitz then drove to a different facility and replayed the sound pictures to a dolphin that had not previously experienced them. The second dolphin identified the objects with a similar high success rate, confirming that dolphins possess a sono-pictorial form of communication. It has been suspected by some researchers that dolphins employ a sono-visual sense to ‘photograph’ (in sound) a predator approaching their family pod, in order to beam the picture to other members of their pod, alerting them of danger. In this scenario it is assumed that the picture of the predator will be perceived in the mind’s eye of the other dolphins. When a dolphin scans an object with its high frequency sound beam, emitted in the form of short clicks, each click captures a still image, similar to a camera taking photographs. Each dolphin click is a pulse of pure sound that becomes modulated by the shape of the object. In other words, the pulse of reflected sound contains a semi-holographic representation of the object. A portion of the reflected sound is collected by the dolphin’s lower jaw, its mandible,where it travels through twin fat-filled ‘acoustic horns’ to the dolphin’s inner ears to create the sono-pictorial image. The precise mechanism concerning how the sonic image is ‘read’ by the cochleae is still unknown but the team’s present hypothesis is that each click-pulse causes the image to momentarily manifest on the basilar and tectorial membranes, thin sheets of tissue situated in the heart of each cochlea. Microscopic cilia connect with the tectorial membrane and ‘read’ the shape of the imprint, creating a composite electrical signal representing the object’s shape. This electrical signal travels to the brain via the cochlea nerve and is interpreted as an image. 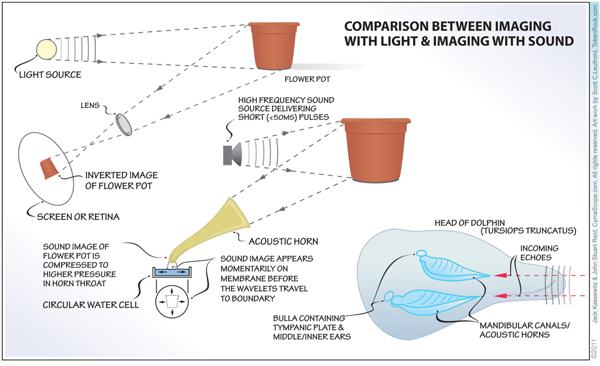 (The example in the graphic shows a flowerpot.) The team postulates that dolphins are able to perceive stereoscopically with their sound imaging sense. Since the dolphin emits long trains of click-pulses it is believed that it has persistence of sono-pictorial perception, analogous to video playback in which a series of still frames are viewed as moving images. 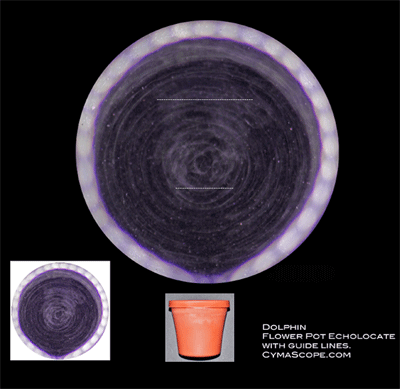 Reid said, “The CymaScope imaging technique substitutes a circular water membrane for the dolphin’s tectorial, gel-like membrane and a camera for the dolphin’s brain. We image the sono-picture as it imprints on the surface tension of water, a technique we call ‘bio-cymatic imaging,’ capturing the picture before it expands to the boundary. We think that something similar happens in the dolphin’s cochleae where the sonic image, contained in the reflected click-pulse, travels as a surface acoustic wave along the basilar and tectorial membranes and imprints in an area that relates to the carrier frequency of the click-pulse. With our bio-cymatic imaging technique we believe we see a similar image to that which the dolphin sees when it scans an object with sound. In the flowerpot image the hand of the person holding it can even be seen. The images are rather fuzzy at present but we hope to enhance the technique in future. ”Dr Horace Dobbs is Director of International Dolphin Watch and a leading authority on dolphin-assisted therapy. I find the dolphin mechanism for sonic imaging proposed by Jack Kassewitz and John Stuart Reid plausible from a scientific standpoint. I have long maintained that dolphins have a sono-visual language so I am naturally gratified that this latest research has produced a rational explanation and experimental data to verify my conjectures. As early as 1994, in a book I wrote for children, Dilo and the Call of the Deep, I referred to Dilo’s ‘Magic Sound’ as the method by which Dilo and his mother pass information between each other using sonic imaging, not just of external visual appearances, but also of internal structures and organs. The ‘exo-holographic’ part of the acronym derives from the fact that the dolphin pictorial language is actually propagated all around the dolphin whenever one or more dolphins in the pod send or receive sono-pictures. 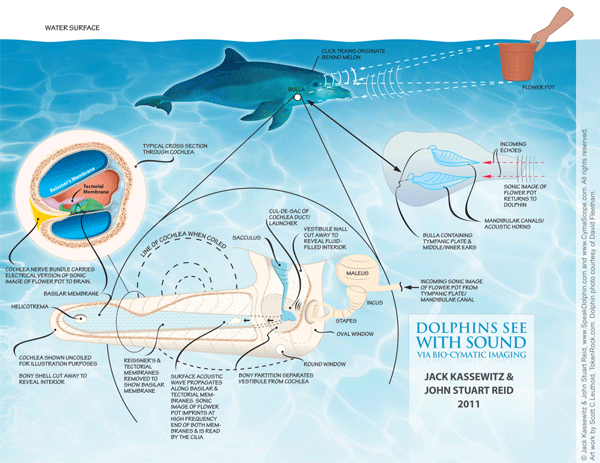 John Stuart Reid has found that any small part of the dolphin’s reflected echolocation beam contains all the data needed to recreate the image cymatically in the laboratory or, he postulates, in the dolphin’s brain. Our new model of dolphin language is one in which dolphins can not only send and receive pictures of objects around them but can create entirely new sono-pictures simply by imagining what they want to communicate. It is perhaps challenging for us as humans to step outside our symbolic thought processes to truly appreciate the dolphin’s world in which, we believe, pictorial rather than symbolic thoughts are king. Our personal biases, beliefs, ideologies, and memories penetrate and encompass all of our communication, including our description and understanding of something devoid of symbols, such as SPEL. Dolphins appear to have leap-frogged human symbolic language and instead have evolved a form of communication outside the human evolutionary path. In a sense we now have a ‘Rosetta Stone’ that will allow us to tap into their world in a way we could not have even conceived just a year ago. The old adage, ‘a picture speaks a thousand words’ suddenly takes on a whole new meaning. The human capacity for language involves the acquisition and use of a complex system of vocal sounds to which we attribute specific meanings. Language, the relationship between sounds and meanings evolved differently for each tribe of humans and for each nation. It is generally believed that the human language faculty is fundamentally different from that of other species and of a much higher complexity. The development of vocal language is believed to have coincided with an increase in brain volume. Many researchers have wondered why dolphins have brains comparable in size with those of humans, considering that Nature creates organs according to need. The Kassewitz team’s findings suggest the large dolphin brain is necessary for the acquisition and utilization of a sono-pictorial language that requires significant brain mass. Dolphins enjoy constant auditory and visual stimulation throughout their lives, a fact that may contribute to their hemispheric brain coordination. The dolphin’s auditory neocortical fields extend far into the midbrain, influencing the motor areas in sucha way as to allow the smooth regulation of sound-induced motor activity as well as sophisticated phonation needed for production of signature whistles and sono-pictures. These advantages are powered not only by a brain that is comparable insize to that of a human but also by a brain stem transmission time that is considerably faster than the human brain. Our research has provided an answer to an age-old question highlighted by Dr Jill Tarter of the SETI Institute, ‘Are we alone?’ We can now unequivocally answer, ‘no.’ SETI’s search for non-human intelligence in outer spacehas been found right here on earth in the graceful form of dolphins. Full results of this research are available on request. Please email either Jack Kassewitz or Stuart Reid. Вам праздничное платье или дюжину пощечин? И даже без инвойса! Селим принялся переводить: «Человек, нашедший это, да возблагодарит Аллаха за его милость! Кто понюхает порошок из этой коробки и при этом произнесет «мутабор», тот может превратиться в любого зверя, а также будет понимать язык зверей. Когда же он захочет снова принять человеческий облик, пусть поклонится трижды на восток и произнесет то же слово; однако, будучи превращенным, остерегись смеяться, иначе волшебное слово совершенно исчезнет у тебя из памяти, и ты останешься зверем». Выдержка из «Рассказа о калифе-аисте» Вильгельма Гауфа в переводе Н. Касаткиной. Рубрики: чтиво | Есть мнение? Некий переводчик пришел к суфийскому шейху и попросил его отредактировать перевод книги Идриса Шаха. «Дорогой друг, — промолвил шейх. — Суфии считают свою литературу действенной, а не просто развлекательной. Чтобы ее способность воздействовать не оказалась утраченной при переводе, не должен ли сам переводчик руководствоваться теми принципами, из которых она исходит?» «Я догадываюсь, что вы имеете в виду, — почтительно отвечал переводчик. — Именно поэтому я стремился предельно бережно следовать тексту оригинала — дабы не внести искажений в смысл». «В том-то и дело. — Шейх улыбнулся и неторопливо поднес к губам чашку с чаем. — Чтобы смысл оригинала остался неискаженным, требуется определенная свобода в обращении с текстом, с его буквой. Смысл должен каждый раз перевоссоздаваться заново — в той форме, которая наиболее применима к данным месту, времени и людям. Таков один из принципов нашего Учения». «Но, видите ли… — смущенно произнес он. — Читатель уже привык к определенному строю речи, ассоциирующемуся у него с суфизмом…» «А, — сказал шейх. — Значит, суфизм у вашего читателя ассоциируется с высокопарностью, псевдозначительностью и нечетким выражением мысли?» К этому моменту переводчик уже честил себя на чем свет стоит: он-то ожидал услышать похвалу, а вышло совсем как в тех историях, которые он переводил! Во что же выльется работа над рукописью?.. Он даже испугался немного: чего еще можно ожидать от этого загадочного человека? «Знаете, — сказал переводчик. — Вообще-то, это не первая книга суфийских притч, выпускаемая у нас в стране. Нашему читателю нравится такой стиль. Если все переделать так, как этого хотите вы, боюсь, он не поймет вашего Идриса Шаха, и книгу не станут покупать». И с тем, вежливо откланявшись, он поспешно забрал у шейха свою рукопись и удалился восвояси. …Выход «Тысячи плато» в русском переводе – событие из разряда тех, которым назначено стать событием, но которые вряд ли на это способны. Вряд ли кого-то сейчас способна всерьез напугать философская книжка такого размера, что ею можно убить небольшое животное. Конечно, какая-то волна поднялась, но скорее автоматическая. Например, в переводчике Якове Свирском многие годы ищут скрытого англофила, утверждая, что все свои переводы он делает с английского. В фактической нелепости этого предположения легко убедиться, сверив несколько страниц из «Тысячи плато». На мой вкус, Свирский так даже слишком верно следует французскому тексту, что иногда может быть проблематичным. Интереснее другое – сама механика анимации, шевеления интереса. Полный текст статьи можно найти на сайте Censura. Утащила только цитату, касающуюся перевода. Суждение задело за живое, захотелось положить в копилочку.